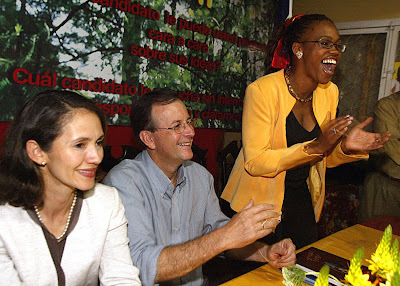 We can’t close out our Elections 2018 coverage without noting another way in which history was made tonight: Epsy Campbell, a longtime presence in the Legislative Assembly and Citizen Action Party (PAC), is now set to become the first female Afro-descendent vice president in Costa Rican history. Stay tuned for more on Alvarado, Campbell, tonight’s surprising landslide and the plans for the new administration. And thanks once more to our incredible team of freelancers who helped us tell the story of this unusual Election Day. From all of us at The Tico Times, good night!